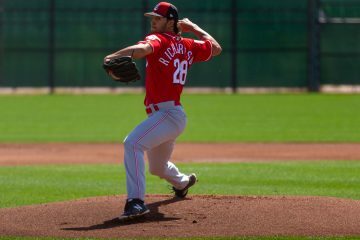 Despite it seeming like the Cincinnati Reds don’t have too much depth in the starting pitching in the minor leagues as they’ve called up guys like Dylan Axelrod, Jeff Francis or even a David Holmberg, the position is actually the greatest strength of the farm system. The problem lies in the fact that for most of the season, it was mostly in Double-A Pensacola and in Low-A Dayton. At the start of the season there was a lot of talk, even nationally, about how the Pensacola Blue Wahoos starting rotation may have been the most prospect heavy rotation in the minor leagues for any one given team. As the season has gone on, the Dayton Dragons rotation may also be able to claim the same thing. Pensacola just lost one of their starters to a promotion to Triple-A Louisville yesterday and Jon Moscot made the start for the Bats last night. That leaves the Pensacola rotation with Ben Lively, Daniel Corcino, Robert Stephenson, Michael Lorenzen and perhaps Tim Adleman who started last night in place of Moscot. Four of the six players on this list made my Midseason Top 10 prospects. The rotation in Dayton includes Nick Travieso, Sal Romano, Amir Garrett, Nick Howard and Jackson Stephens. Only two players on this list made the Midseason Top 10 list, but Nick Howard had not yet signed and was not eligible for the list. Amir Garrett has continued success he was beginning to show and it would be incredibly difficult to keep him out of an updated list at this point. This is probably the deepest that the organization has ever been in starting pitching. While I have only been covering the farm for the last 9-10 years, pitching hasn’t ever really been a strength of the organization throughout it’s history until recently and while pitching prospects aren’t always reliable, the team is just stocked right now. With how things are looking at 2016 right now, that may be a very big deal. Mat Latos, Johnny Cueto, Mike Leake and Alfredo Simon are all free agents after the 2015 season. Tony Cingrani and Homer Bailey are both currently on the disabled list with arm injuries. While it seems that most people expect the team to retain at least one of the Latos/Cueto group, until it happens we are all just hoping that it happens. As noted above, pitching prospects haven’t historically been reliable. With that said, teams have gotten much better at keeping them healthy over the last 10-15 years and when they do go down with injury, the surgery and rehab abilities have come a long way as well that has done wonders for cutting down on the rate of pitching prospects that just flat out don’t make it. At this point in time, I am of the belief that Robert Stephenson and Michael Lorenzen are at the top of the charts in a group by themselves. But after that, there could be an argument for an ordering of Nick Travieso, Amir Garrett, Sal Romano, Ben Lively, Nick Howard and Jon Moscot however you would like to put them and you could make a sound argument for it. That gives the team a whole lot of options to work with if there are injuries or ineffectiveness moving forward from a few guys. There aren’t many teams in baseball who have so much to work with in terms of starting pitching on their farm. The other advantage that it has is that it gives the Reds multiple options for making trades if they choose to go down that road. While I think maybe only a Stephenson or a Lorenzen could be a center piece to a trade at this point because of their top end stuff and their relative proximity to the Major Leagues, the other guys could be used as a major part to a deal that included another player to help bring back something for the big league team. With six of the eight positions on the field locked up for the next few years (only left field and shortstop seem to be areas where the Reds may actually look to upgrade), being very pitching heavy on the farm plays quite well with how the big league roster is shaped. With the 2015 All-Star game coming to Cincinnati and the window of the current version of the rotation closing quickly, the team is going to feel a whole lot of pressure to put a winner on the field from day one. 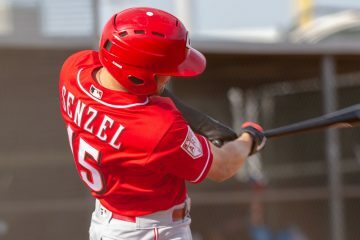 Things haven’t exactly gone smoothly in 2014 for all sorts of different reasons, and we know that Bob Castellini isn’t the most patient man when it comes to his expectations for winning, when the December meetings roll around, don’t be surprised if the Reds and several of their pitching prospects are rumored in moves. They have the depth and they have the guys that will draw interest. I am excited by the depth in the minors. There will be growing pains but I think replenishing the ratation and bullpen over a few years should be doable. In spite of the problems this year, I am already excited for the 2015 season. Personnally, I hope the Reds don’t use Stephenson or Lorenzen as trade bait. Would love to see them both in Reds uniforms for years to come. The organization is heavy with good pitching, and perhaps could parlay some of that into a hitting LF or SS. I love Cozart, Heisey and Ludwick, but something needs to be done to add some points to the team batting average. Cosart is one of the best in the biz on defense, but his bat lacks, so the question is, can the Reds overlook his no-hit reputation and be happy enough with the glove? Probably, but a consistant power-man is needed, probably for LF. Heisey has lost the strike zone this year, and I’m not sure Ludwick ever had it, except for the Rockies. And good young minor leagure pitching could bring the Reds a couple of good middle releif arms it so desperatly needs. Dayton has several good prospects in line, like Travieso and Ervin, just to name a couple. Give them some time and it will be fun to see what they can do dressed in red…. With Chad Rogers outrighted off the 40-man roster, that creates an openeing on the 40-man roster. WJ doesn’t usually leave any openings on the 40-man roster and doesn’t remove anyone from the 40-man roster without a specific need for that roster spot. The Reds will need a starter on Thursday, but Holmerg was held out of his start last night at Louisville. That makes Holmberg available for the Thursday start and explains why Axelrod was optioned back to Louisville after his good effort on Sunday. It seems way too early to open up a 40-man roster spot for Votto. I just wonder (hope?) what WJ is doing with the 40-man roster. Do you know if Lorenzen is on an innings count or a pitch count? I see that he has pitched more than 5.0 innings in only 7 of his 22 starts. Even if he has only given up 2, 1 or even 0 runs, he comes out. Is this part of the transition from reliever to starter? If so, should we expect to see the same with Howard next year? Glad to see Moscot go to AAA. He looked to be pitching the best at AA at this time. He is on a pitch count and innings count. I think he needs one more year to build up his arm strength to make 30 starts. He’s on an 85 pitch limit and a 125 innings limit. The pitch limit hasn’t always been in play this season, it was a bit higher earlier in the year, but they’ve cut back on it over the last 5-6 weeks. I would expect the same for Howard next season. I saw that over on your site about an hour after I posted that question. Thanks for the details. At 113.2 IP, Lorenzen is right on target with about 3 more starts ahead of him. Though the team has lots of pitching prospects, there are places where there is other depth as well. I may be wrong, but i think the Reds also believe they have several OF prospects that are a year or two away. Plus, they may feel that Negron can be aimed at Cozart. This makes me wonder what the Reds would try to add. Certainly LF is a problem, but do you block prospects by bringing in someone who will play the position long term? The reluctance, over the last couple of years to make a trade or sign someone of substance may be the Reds changing the philosophy of trading for players, and instead signing and developing their own. Outfield is another spot where they are fairly deep. I don’t think we will see a long term left field answer brought in this offseason as they bridge the gap to one of the young guys for 2016, or sooner if someone shows they are ready.